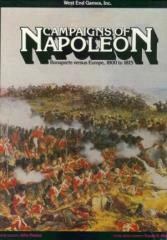 The Emperor Napoleon I fought valiantly to unite the whole of Europe under French rule. The foremost military genius of his time, Napoleon's campaigns swept across the breadth of the Continent, and very nearly toppled the world's oldest monarchies. Each player represents France or one of her enemies during the Wars of the Empire. Playing pieces represent the actual military formations of the time, and are maneuvered across an accurate terrain map of central Europe. Many unique rules capture the flavor of the period, including the economics of war, diplomacy, fortresses, leaders and much more.